What to do with Boko Haram? The legal tender for public bidding should not be the US Dollar in Turkey. Let us produce the materials required for our defense industry and not pay money to any other country. The Dollar and the Euro should be removed in financial transactions within Turkey, let’s use our own money only. Turkey is a self-sufficient country. Creating an economic crisis by way of raising the value of the Dollar is an easy task for the British Deep State. It only requires them to activate a few institutions. Turkey, Iran, China and Russia must trade with their own currencies. There is no need to trade with Dollars and Euros. Let us define a term and after that term let us legally take Dollars and Euros completely out of circulation in Turkey. The Dollar and the Euro should legally be taken out of circulation within Turkey. It should not be based on people’s will whether to use them or not. In the wake of the September 11th Attacks, there has been a notable increase in the prejudiced and discriminative demeanor of the Western world against Muslims stemming from the antagonism rising against Islam in Europe and the USA. Based on this bias and partiality, it is a sad fact that the Islamic communities living in the West encounter a good deal of adversity and distress both in their social and work lives. Though it appears that the September 11 attacks are the onset of this notion, the assertion that Islam is a so-called global threat and the laying of the political and ideological foundations of the perception of Islamophobia go back to the start of the 90’s: The publication of “The Clash of Civilizations” in Foreign Affairs magazine’s summer 1993 issue by the former foreign policy adviser to the Secretary of Defense of the USA, Samuel Huntington. The thesis of the so-called “The Clash of Civilizations” anticipated that there would be no longer an East – West polarization after the Cold War but the most momentous conflict would occur between cultures, mainly the West and Islamic Civilization. In an interesting kind of way, today the circumstances have turned out just as predicted in Huntington’s thesis and it is still persisting. Regarding Islam to be more dangerous than irreligious and abominable ideologies is undoubtedly reprehensible. These expressions published in one of the most popular newspapers in the USA and which put forward Huntington’s thesis in a more clear and precise way remind us of some very key questions: Had Huntington really foreseen the future so well? Or was he preparing for the theoretical and psychological foundation of a long-term global project that would target Islam? Although it is a known fact that Islamophobia in the USA, a country known for its diversity, is less of a problem when compared to Europe a recent report suggested that the anti-Islamic sentiment rising in the background has reached unexpected levels. 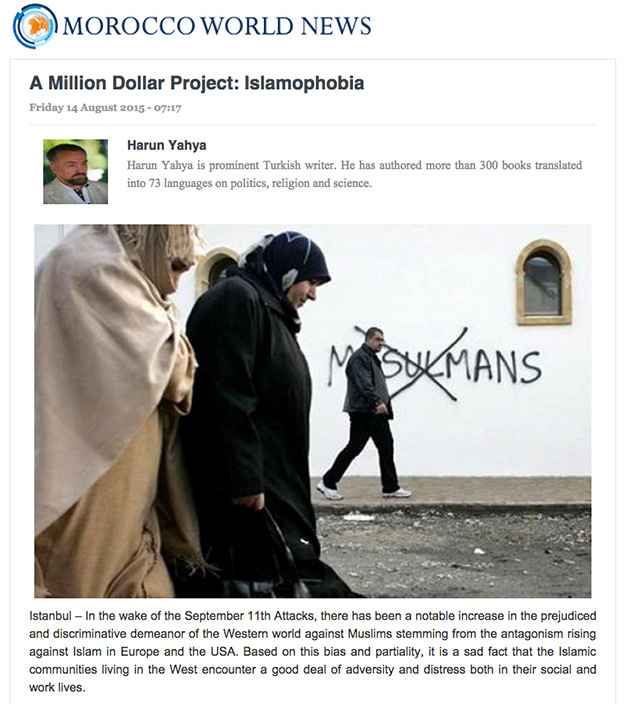 Published by the Center for American Progress, “The Islamophobia Network’s Efforts to Manufacture Hate in America” claims that the total amount of financial aid provided to organizations that carried out anti-Islamic campaigns between 2001-2012 had reached 57 million US dollars. The report also reveals the names of organizations that have been producing hate propaganda against the religion of Islam and Muslims for years, as well as the names of their top eight main financers and the amounts of donations. Islamophobic campaigns and propaganda involving anti-Islamic news reports, advertisements, cartoons, films and documentaries all work to create a fierce image in the American society where even moderate Muslims are seen as members of terrorist organizations. According to the report, these campaigns are particularly led by certain media outlets and certain politicians and they make use of conspiracy theories like ‘Muslims want the USA to be ruled by Sharia law’. A part of these efforts include the upcoming 2016 Presidential race, where the candidate that seems best poised to ‘save’ Americans from Islam is likely to get the highest votes. As a result, Islamophobia is now playing a major part in political campaigns and in the election propaganda of some politicians. A study by UCLA professor Travis Dixon found Muslims are greatly overrepresented as terrorists in U.S. media as compared to FBI reports. The study sampled 146 episodes of news programs focused on breaking news carried by major broadcast and cable networks between 2008 and 2012 and found that among those described as domestic terrorists, 81 percent were identified as Muslim. Yet in FBI reports from those years, only six percent of domestic terror suspects were Muslim. This deliberate operation, aimed at creating an atmosphere of hatred against Muslims, and that is run with great determination through media outlets, websites, think-tanks and political organizations, is the clearest indication that there is a systematic campaign being carried out against Islam and the Muslims. Even though election policies, global interests, a desire to justify the massacres carried out against Muslims, the goal of holding on to power in the Middle East and gaining control over natural resources in the Islamic world, and complex plans to transform the Middle East into an ocean of blood and pain all work to fuel Islamophobia, there is another and stronger reason behind this scourge; radicalism a scourge that has engulfed the Islamic world! Regrettably today, a majority of Muslims, due to deep ignorance, are ensnared by radicalism masquerading as Islam. Radicalism – in other words, a superstitious religious understanding – is a twisted state of mind that is hostile to the modern way of life, and is built on a synthesis of various extremist, bigoted tribal traditions and superstitions. The presence of a community which adopts a superstitious religion instead of the true Islam as described in the Qu’ran, and which offers war, radicalism, misogyny, opposition to art, science and sophistication as a way of life, is deeply concerning to the entire world. These people exploit the name of Islam, terrorize people using the name of God and are apparently enraged by everything that is beautiful. It is the most natural thing for the Western world to feel worried about this horrible and terrifying philosophy, especially when they don’t have real knowledge about Islam. Islam, in its purest form in the Qur’an, commands the loftiest moral values and highest and most sophisticated lifestyle that brings about ultimate forms of love, compassion, brotherhood, art, culture, civilization, modernism and cleanliness. The Islam of the Qur’an, in complete contradiction to the superstitious religion model, is a religion that would gain the immediate support and approval of even the most biased person and could effectively bring real peace to the whole world. Even a bit out of that $57 million dollars spent for anti-Islamic campaigns would be sufficient to introduce the real Islam, to show the distinction between Islam and extremism and to wipe out the mentality of radicalism for good, thus effectively ending terrorism. However, the fact that this most effective, practical and easy method conflicts with the interests of some circles is what creates the biggest obstacle to a solution.